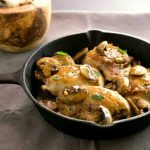 A simple, super flavorful, one skillet keto Portuguese style chicken dish that is low in carbs, paleo, and Whole30Ⓡ. 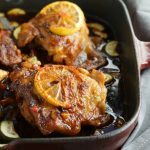 An all in one skillet keto Portuguese style chicken meal that is bursting with flavors from the spices and citrus accents in the marinade. 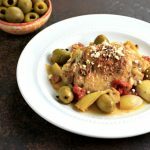 My low carb, stylised version of a classic Portuguese chicken dish called Piri Piri. I made the recipe in a cast iron grilling pan instead for the traditional outdoor grill. I also made it a little less spicy and marinated it for a bit less time, but without sacrificing flavor. 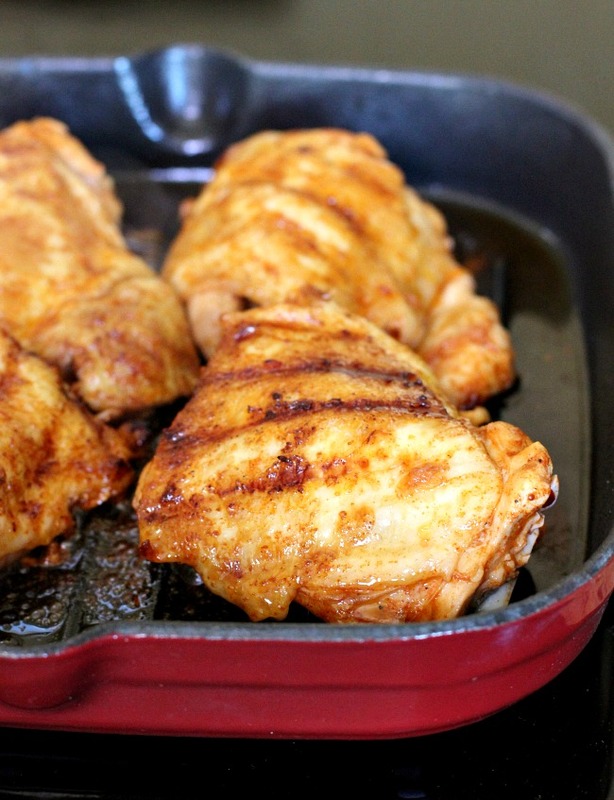 Chicken Simply made in one pan that can safely go from stove-top to the oven. You can make this dish in a cast iron skillet, oven-safe skillet or grilling pan. I used a cast iron grilling pan that can go from stove-top to oven. I also included some zucchini and red bell pepper to the dish, which makes it an entire meal in one pan. Fewer dishes and clean up, for me, is always a win! Place all marinade ingredients in a large bowl and whisk until blended. Add chicken thighs to the marinade and turn to coat. Cover the bowl with plastic wrap and refrigerate for 2 to 4 hours. Preheat oven to 400° F( 204° C). Heat 1 tbsp avocado oil in a cast iron grill skillet or an oven-safe skillet over medium-high heat. Add chicken to the skillet and brown both sides of chicken until golden brown (about 4 minutes on each side). Once browned, turn off heat. Add zucchini, and red peppers to the skillet arranged around the chicken. Pour any extra marinade from the bowl over chicken and top chicken with lemon slices. 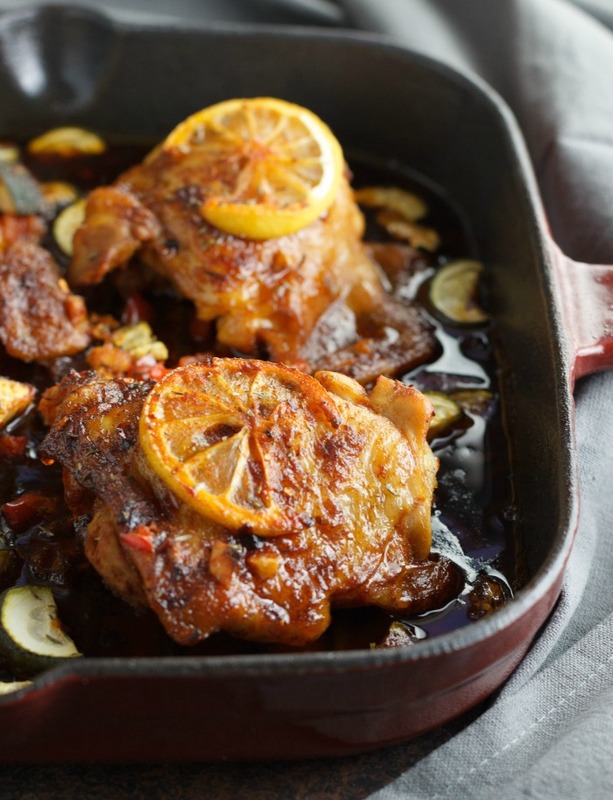 Place skillet in the oven and bake for 30 to 35 minutes or until internal temperature of chicken reaches 165 F to 170F. Remove skillet from oven and let rest for 8 minutes and serve. Nutritional Data: Servings: 4, Serving Size: 1 large chicken thigh (225 g) with ¼ of veggies, Amounts Rer Serving- Cal: 439, Carbs: 7g, Net Carbs: 5g, Fiber: 2g, Fat: 26g, SaturatedFat: 4g, Protein: 45g, Sugars: 3g. Yield: 4 servings, Serving Size: 1 lg chicken thigh with 1/4 of veggies(225g), Net Carbs Per Serving: 5g. 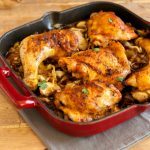 I love a easy and flavorful skillet dinner, and this looks absolutely fantastic! Oh wow, this recipe looks like it’s packed with flavor. I love lemony savory dishes. Delicious! Thank you so much, Catherine. Wow I love all the ingredients in the marinade! I bet it makes all the difference. 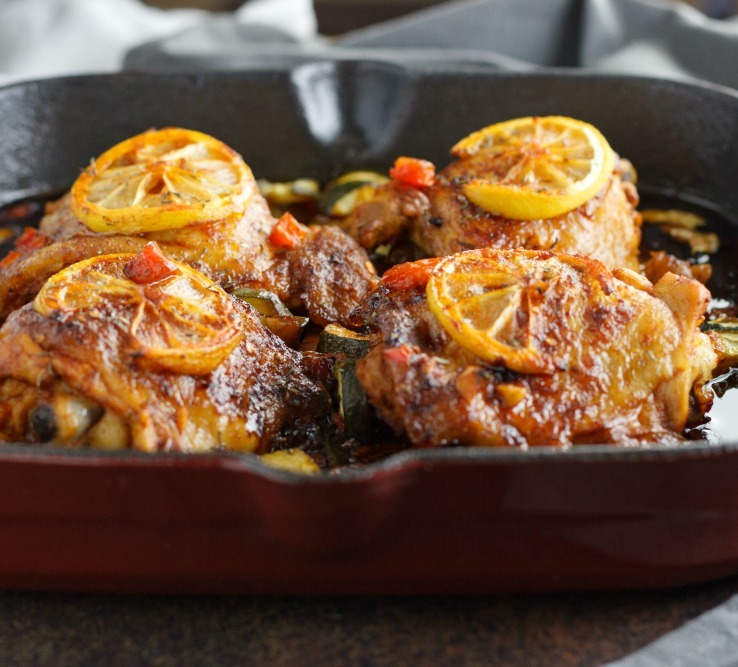 This skillet chicken dinner looks so flavorful and beautiful enough for company! I can not wait to try it! Beautiful! I love this recipe! Love this dish! All of these ingredients are speaking to me and all in just one skillet!! Hi, this looks so good. 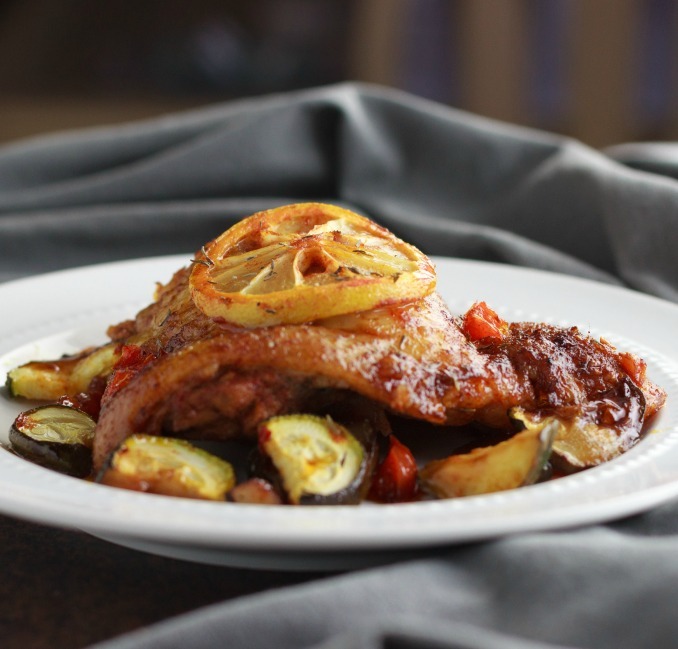 I’m going to be making this for dinner either tonight or Friday for my partner, however I don’t like zucchini, is there something else I could use instead? Also would coconut oil work, as my partner is allergic to avocado. Alicia, you could use yellow squash instead of zucchini, and yes, coconut oil or olive oil will work. This looks amazing and I am going to make it. Was wondering about Avacado Oil. Not familiar with it. Please tell me if this a key to the recipe? Cindy, it is not a key ingredient and you can use olive oil instead. Yes, Georgie, I try to avoid doing dishes whenever possible, lol. I don’t have too much chicken but this looks so tasty I might have to change my mind! YUM ! So colorful and full of flavor. Portugese style chicken is the best ! Totally love it ! Awe, thank you lovely ChihYu! Oh em gee! This looks absolutely divine! That pan sauce is everything. One skillet meals are totally my jam. This looks super tasty. Katja, me too! I just don’t like doing dishes! You’ve outdone yourself again Stacey! Pinning this for the weekend! Oh man that marinade is just everything! 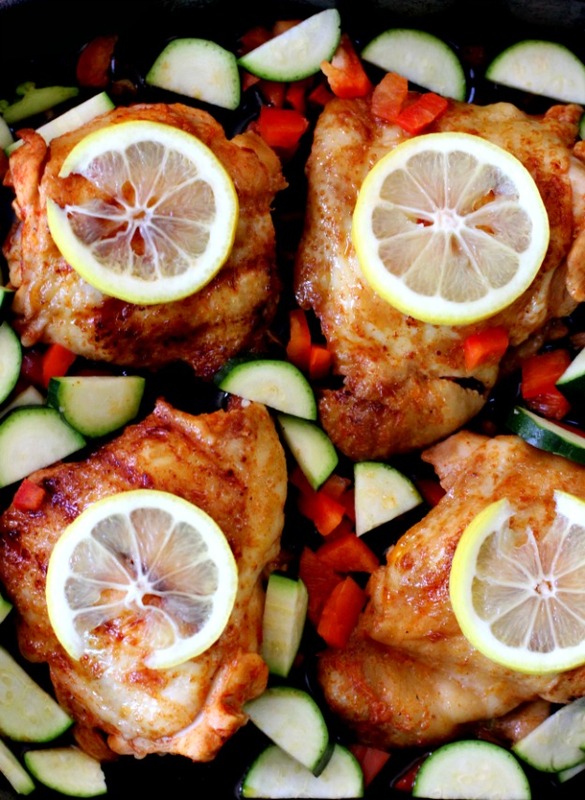 Looks so amazing – such a fantastic simple weeknight dinner! Thank you! This chicken looks amazing! That marinade sounds so good! I love and appreciate your many photos of the process and outcome. The marinade and whole dish look delicious!! 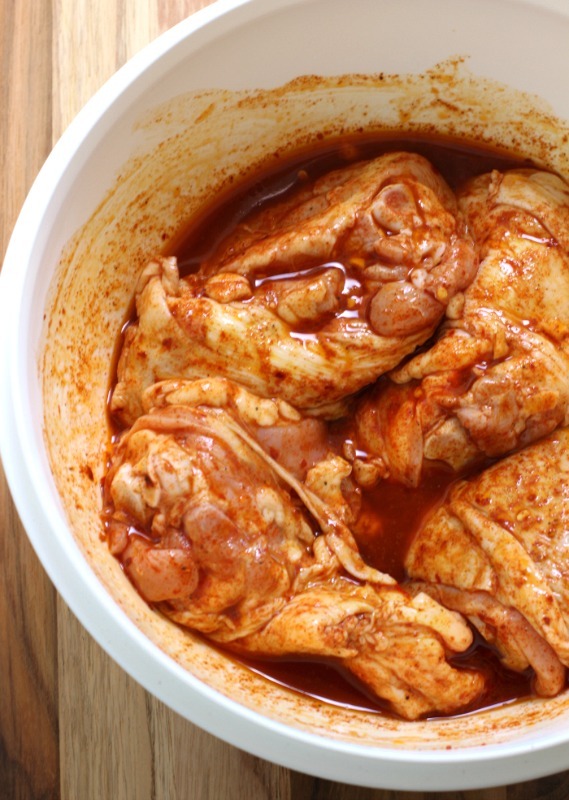 That marinade sounds amazing and makes the prettiest red-golden color on the chicken. 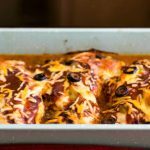 I know this would be a huge hit with my family, we’re one-skillet chicken lovers. What a gorgeous chicken dish! Love all those spices in there and that skin looks perfectly crispy. Must try this! I love the combo of flavors, and i am always marinating stuff in large batches for quick meals ready to go in the freezer! I have no marinade like this, so this is going on the menu!